Thank you to GEA Members New and Renewed! Check out LiveScience’s exploration of what happened to geothermal energy. SACRAMENTO, CA – California will host the geothermal energy event of the year fromOctober 23-26, just 9 weeks away. This event brings together key players in policy, technology, and industry at the Sacramento Convention Center — the GRC Annual Meeting& GEA GEOEXPO+. Last year, the event hosted more than 1,200 representatives from over 25 countries spanning six continents. With the strong growth in the world market and positive role of policy and new technology that supports that growth, an even larger and more diverse crowd is anticipated this year. The GRC Annual Meeting will feature over 40 hours of technical presentations, workshops, fieldtrips, a plenary session, networking events and more. The GRC Technical Session programs will cover a wide array of topics pertaining to geothermal energy. The program will cover exciting technological developments such as the work of the DOE in low-temperature systems, innovative drilling tech, and hybrid systems including geothermal mixed with solar at a time when new technological advances are advancing the geothermal industry at a rapid pace. Four workshops and four fieldtrips will be held at the event. The two-day Conceptual Models of Geothermal Systems and Reservoir Stimulation workshops and a one dayOperations & Maintenance workshop. In addition, there will be a special Geothermal 101workshop. The fieldtrips will include excursions to The Geysers, the largest geothermal field in the world. The GRC Annual Meeting this year supports the theme “Geothermal Energy – Here and Now: Sustainable, Clean, Flexible” highlighting the important role and values of geothermal energy today. “This will be the 40th year the GRC has brought together the US and international geothermal community,” said Steve Ponder, GRC Executive Director. Registration is now open for the GRC Annual Meeting. The GEA is launching an expanded and newly branded event the GEA GEOEXPO+. The event brings to life the theme “Leading Innovation. Fostering Cooperation.” “It takes the best technology, and a top-notch team to succeed in today’s marketplace, and the GEA GEOEXPO+ is meant to facilitate both,” said Karl Gawell, GEA’s Executive Director. Who are the game changers in the geothermal energy industry? 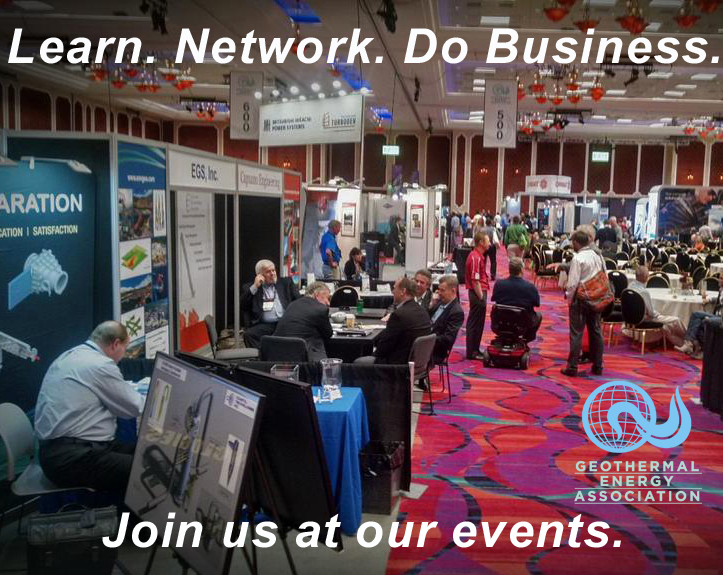 Check out the sessionExhibitors Leading Innovation at the GEA Marketing Forum to see how GEA’s 2016 Exhibitors are paving the way for geothermal development through new projects, products/ services, and technology. Interested in how federal and multilateral agencies can help geothermal power and possibly your business? Representatives from OPIC, USTDA, World Bank, Ex-Im Bank, US DOE GTO, USAID amongst others will step onto the Marketing Forum stage for theAgency Briefing. The goal- to bridge the gap between US companies and agency opportunities related to financing, grants, project work and resources. Other sessions include a KfW Development Bank Finance, Grant and Investment Workshop. Visitor registration for the GEA GEOEXPO+ is now open and the GEA Marketing Forum Agenda was released earlier this week. With a multi-dimensional 3-day trade show and marketing forum and ample opportunities for networking, the GEA GEOEXPO+ presents attendees with the opportunity to maximize their exposure at a premier event. If you want to learn more about geothermal energy, consider attending the GRC Annual Meeting or contact Estela Smith at +1 (530) 758-2360 or email grc@geothermal.org for more information. If your company has a strong interest in promoting its projects, equipment, services, and technology as part of the GEA GEOEXPO+ please contact Rani Chatrath Rani@geo-energy.org +1 (202) 454-5261 to learn more about opportunities still available. GEA works to put geothermal on the map in Washington, Sacramento, and elsewhere. We depend upon our members support to do so. We work to make a difference so that the industry and your company can succeed. Watch for more thank you’s in future editions of GEW! If you need information about membership go to: http://geo-energy.org/membership.aspx or contact Daniela@geo-energy.org. The Office of Basic Energy Sciences (BES), in support of the DOE Office of the Under Secretary for Science and Energy’s Subsurface Technology and Engineering Research, Development and Demonstration (SubTER) Crosscut Initiative, announces a Small Business Innovation Research (SBIR) and Small Business Technology Transfer (STTR) funding opportunity that seeks to develop advanced methods to access the subsurface. While subsurface sources constitute the nation’s primary source of energy, providing more than 80 percent of total U.S. energy needs today, they are also critical to the nation’s low-carbon and secure energy future. Next generation advances in subsurface technologies will enable access to more than 100 gigawatt-electric of clean, renewable geothermal energy, as well as safer development of domestic natural gas supplies. The subsurface provides hundreds of years of safe storage capacity for carbon dioxide (CO2) and opportunities for environmentally responsible management and disposal of hazardous materials and other energy waste streams. These opportunities are directly linked to Administration priorities and to broader societal needs. Clean energy deployment and CO2 storage are critical components of the President’s Climate Action Plan and are necessary to meet the 2050 greenhouse gas emissions reduction target of 83 percent below 2005 levels. Thus, discovering and effectively harnessing subsurface resources while mitigating impacts of their development and use are critical pieces of the nation’s energy strategy moving forward. Pasadena, Calf. – Today the California State Assembly approved legislation, Senate Bill 32 (D-Pavley), which extends California’s landmark climate protection policies through 2030. In order to become law, the measure must go back to the Senate for concurrence. Senate Bill 32 is also still dependent on passage of companion legislation. The World Bank has published a procurement notice for the Turkey Geothermal Development Project, with funding of up to $290 million to support early stage development in Turkey. The World Bank has issued a procurement notice (P151739) for its Turkey Geothermal Development Project. The Republic of Turkey has applied for financing in the amount of US$ 40 Million from the Carbon Trust Fund (CTF) through the WorldBank as a Grant; and Turkiye Kalkinma Bankasi A.S. (TKB) and Turkiye Sinai Kalkinma Bankasi A.S. (TSKB) applied for a Loan in the amount of US$ 150 million and US$ 100 Million respectively from the World Bank toward the cost of the Geothermal Development Project, and they intend to apply part of the proceeds to payments for goods, works, non-consulting and consulting services to be procured under this project. Component 1, Risk Sharing Mechanism for Resource Validation: This component will establish a Risk Sharing Mechanism (RSM) for Resource Validation, to support the exploration and confirmation drilling stages. Funds will be channeled to Turkey through a World Bank administrated trust fund and will be utilized to support private sector geothermal investors. TKB will be the lead implementing agency of this Component. Under this component, TKB will hire a consultant to establish and operate the RSM. The “RSM Consultant” will provide specialized financial and geothermal expertize to the RSM, specifically regarding the interpretation of surface exploration data, development of conceptual models, drilling and testing, and assessments of development and business plans provided by potential beneficiaries. It is envisaged that the request for expression of interest will be published in October 2016. Component 2: Loan Facility for Resource Development: This component will set up a Loan Facility for Resource Development to provide financing to the resource development stage and to the power plant development phase. As the Financial Intermediaries (FIs) TSKB and TKB are expected to incentivize the developers to take more risk at earlier development stages than they would do under usual market conditions. The procurements under this component will be conducted by private sector geothermal developers and they will apply well established commercial practices in the procurement of goods, works,non-consulting and consulting services. Procurement of goods,works and non-consulting services for the proposed Project will be carried out in accordance with the World Bank’s “Guidelines: Procurement of Goods, Works and Non-ConsultingServices under IBRD Loans and IDA Credits & Grants” dated January 2011 and revised in July 2014. Selection and Employment of consultants under IBRD Loans and IDA Credits & Grants by World Bank Borrowers dated January 2011 and revised in July 2014. Using the Earth’s heat is key to fighting global warming. What may seem like a paradox is instead playing an increasingly important role worldwide. In the last 10 years, the world’s installed capacity of geothermal energy has increased from 9,000 MW to about 13,000 MW, and it will continue to grow at an exponential rate: according to the latest projections, it is expected to exceed 20,000 MW by 2020. Enel plays a key role in this process: we are the only operator able to cover the entire project cycle, from the exploration and the construction phase to plant operation. Thanks to its 34 plants in Tuscany, Italy is one of the world’s leading countries in terms of installed geothermal capacity. In Larderello, Tuscany, geothermal energy was used for industrial purposes for the first time. Since then, Enel’s Tuscan geothermal district has acquired global recognition, with over 150 visits since 2000 on behalf of representatives from countries such as Chile, the US, China, Japan and Indonesia. Indonesia particularly boasts a vast geothermal energy potential, which is still largely untapped: an estimated 24 GW, accounting for 40% of the world’s geothermal reserves. This enormous energy potential has driven Enel to explore the Asian country’s renewable market. Following a tender launched by the Indonesian Ministry of Energy and Mineral Resources, we were recently awarded – in consortium with the local company PT Optima Nusantara Energi – an exploration and development license for the 55 MW Way Ratai project. However, Indonesia is not Enel’s only “new geothermal frontier”. With the acquisition at the beginning of 2016 of a majority stake in Erdwärme Oberland (EO) – a German company specialised in the development of geothermal projects – Enel seeks to explore the potential of this technology in Germany in Bavaria. EO has in fact been granted a concession by the Bavarian institutions for the construction of a 26 MW plant near Weilheim, about 50 km from Munich. From Tuscany to the Andes, our geothermal energy is synonymous with innovation. In Italy, we added a small power plant powered by locally-sourced biomass, produced within a radius of 70 km from the plant, in order to supplement the existing Cornia 2 geothermal facility, marking the world’s first geothermal-biomass hybrid plant. In Stillwater, Nevada, in the United States, we built the first facility in the world to combine a photovoltaic plant (26 MW) and a solar thermal power (2 MW) with a geothermal power plant (medium-enthalpy binary cycle). Further south, in the Andean Plateau in Chile, we built the Cerro Pabellón plant: the first South American facility to use the heat of the Earth to generate energy and the world’s first plant built at 4,500 meters above sea level. The small businesses selected today will have the ability to work with 12 different national laboratories, now including Savannah River National Laboratory, Fermi National Accelerator Laboratory, and the National Energy Technology Laboratory. With 23 million small businesses currently operating in the U.S., the pilot is heavily targeted in attracting companies that typically would not have access to the department’s national labs’ scientific expertise and resources. The SBV pilot makes it possible to direct the power of the national laboratories toward specific problems identified by small businesses by pairing these companies with a national laboratory uniquely qualified to solve their challenges. SBV is a collaborative, national effort that provides $20 million for U.S. companies to help improve industry awareness of national laboratory capabilities and provide small and mid-size businesses access to the resources available within the national laboratory system. Following open calls for “Requests for Assistance” (RFAs), businesses are competitively selected to work with a national lab to address their needs, and provided vouchers, worth up to $300,000 at the lab. Geothermal: Four collaborations in the geothermal area will include exploring a recently discovered geothermal resource in Nevada, ensuring that new geothermal extraction and storage solutions are ready for the market, and developing lower-cost methods for extracting rare earth elements critical to clean energy technologies. The Energy Department’s Office of Energy Efficiency and Renewable Energy (EERE) accelerates development and facilitates deployment of energy efficiency and renewable energy technologies and market-based solutions that strengthen U.S. energy security, environmental quality, and economic vitality. SBV is part of EERE’s Technology-to-Market program. To learn more about the pilot, including eligibility and how to apply, visitwww.SBV.org. Two small businesses working with Lawrence Livermore National Laboratory (LLNL) will receive more than $350,000 for expertise in advanced gas turbine manufacturing and geothermal engineering as part of the Department of Energy’s (DOE) Small Business Voucher (link is external) (SBV) pilot. Specifically, LLNL scientists James Kelly and Jeff Haslam and Annemarie Meike from the Lab’s Industrial Parnerships Office will help Renaissance Services Incorporated (link is external) (RSI) with thermal process analysis and improvements for RSI’s additively manufactured ceramic cores, used in the casting of high efficiency turbine engine components. In the other LLNL collaboration, scientists Joe Morris and Rick Ryerson will work with GreenFire Energy (link is external) to develop a novel technology in which carbon dioxide is circulated through deep well bores to harvest geothermal energy. SBV is a collaborative, national effort that provides $20 million for U.S. companies to help improve industry awareness of national laboratory capabilities and provide small and mid-size businesses access to the resources available within the national laboratory system. Following open calls for “Requests for Assistance” (RFAs), businesses are competitively selected to work with a national lab to address their needs, and provided vouchers, worth up to $300,000 at the lab. SBV is part of DOE’s Office of Energy Efficiency and Renewable Energy (EERE) (link is external) Technology-to-Market program. In a guest post Daniel Fleischmann of Mountain Man Alternative Energy Consulting, he makes the point that “geothermal energy in the U.S. isn’t growing, but that [this] maybe not what’s important.” The following is his article. On August 5th, it was noted on Think Geo Energy in the article “IEA reports on renewable energy growth – low growth rates for geothermal” that geothermal energy is not growing like solar and wind energy. This is true, but is it concerning? As an example, let’s take a look at the United States. In all likelihood the U.S. geothermal industry will not exceed its record generation of 1993 any time soon. That year 16.79 terra-watt hours were generated from geothermal energy in the U.S. 1993 was the year that the Puna Geothermal Venture came online in Hawaii. It was after the primary build out of the Imperial Valley/Salton Sea plants and at Coso Junction in California. It was after the last of Nevada’s PURPA-era contracted plants were completed. The last group of new plants installed at The Geyers field in California began operation in 1989. By 1993, production was declining at The Geysers due to overproduction and a lack of recharge. But all the new plants in other fields were enough to reach record production that year in the U.S. By 1995, total U.S. generation declined by 20% from the 1993 high. 1995 had the lowest generation total of any year since 1993. This drop was due almost entirely to The Geysers. Production stabilized in the years that followed after lower production forced some plants in the Geysers field to close and California came out of a drought when heavy rainfall increased recharge into the steam reservoirs. 22 years later, the U.S. came very close to matching 1993 when 16.74 terra-watt hours were generated in 2015. 2016 and 2017 look like they will be in the same range (16.5-16.7 terra-watt hours). But this is only after a decade long boom period (2005-2015) added over 25 new plants to the electric grid. This boom period wasn’t like the first. During the late 1980s, nearly all of the largest known geothermal fields in the country were developed. The only exceptions were locations close to National Parks or areas that were later designated off-limits to development (Cascades in the Pacific Northwest, Valles Caldera in New Mexico, etc.) Over the past decade, most of the fields developed were between 10 MW and 50 MW. In 1993, geothermal energy was one half of one percent of all U.S. electric generation. In 2015 it was four-tenths of one percent. Conversely in 1993, solar and wind power combined were one-tenth of one percent of U.S. electric generation. In 2015, they were 5.8%. They are on track to be about 7% in 2016, and possibly over 8% in 2017. The U.S. geothermal industry has widened its geography in the past two decades. In 1993, four states had utility-scale geothermal power plants. Now, it is 7 states. Geothermal energy has been produced in 13 states when including demonstration facilities of various sizes over the years. In 1993, only California generated solar and wind energy of any significant quantity. In 2015, almost half of U.S. states have significant production from solar energy (over 100 giga-watt hours annually) and about 70% of U.S. states have significant production from wind energy. By 2017, 75% of U.S. states will have significant production from wind energy, and about two-thirds from solar energy. By the end of the decade it appears both solar and wind will enjoy a significant presence in at least 40 of 50 U.S. states. Geothermal power plants have great value once constructed. They produce a lot of energy from a small land footprint. They operate as a base-load facility. But fields decline over time and geothermal will likely never produce significant energy in more than a handful of U.S. States. This is what makes the U.S. different from most other countries. Indonesia’s geothermal resources are all over the country, and the population is very aware; the same with Italy, Japan, Kenya, The Philippines, and Turkey. But in the U.S., if people aren’t talking about geothermal energy in New York, Ohio, or Texas, it just isn’t seen as important. So what do we do about it? Do we just throw up our hands and think, it was a nice run while it lasted? No, I think the current strategy is the correct one. The U.S. Government through the State Department and Department of Energy are focused on encouraging development in other parts of the world, and investing in next generation technologies. In an increasingly globalized society, a technology is relevant as long as it is being utilized somewhere on earth to a significant degree. The U.S. geothermal industry has faded into the background because wind and solar energy caught up over time. But geothermal energy was developed first because it was the most straightforward, simplest way to produce energy from a renewable source based on the technology available. That advantage will maintain the industry going forward, even if the industry isn’t breaking records. Geothermal doesn’t have to grow as fast as solar or wind to be relevant. Biomass energy and hydro-electric power are not in their ascendance, but both technologies continue to play an important role in energy generation both in the U.S. and across the globe; and so will geothermal energy as long as we continue to invest in it where it makes the most sense. China is expected to more than triple geothermal power consumption by 2020 to 72.1 million tonnes of coal equivalent from the current level, an expert said Monday. By 2020, geothermal power will likely account for about 1.5 percent of the country’s total energy consumption, Cao said, helping to reduce carbon dioxide emissions by 177 million tonnes. In 2014, the amount of hot dry rock, the most abundant source of geothermal energy, on the Chinese mainland was estimated to be the equivalent of 860 trillion tonnes of standard coal, or 260,000 times China’s annual energy consumption that year. A pilot project has been started at Leduc No.1 to make use of the 78,000 abandoned and disused oil well sites across Alberta. This summer, Pomphrey Industries is working on a pilot project to use the infrastructure of a modern oil well near the Leduc No. 1 Discovery Centre to provide heat for the museum. Preparation for the project is expected to start this fall. “I was excited right off the bat, because, for me, I love renewable energy, I think it’s the future, but also the fact that we’re using it with oil and gas to show how all of these systems work together was a big deal for me,” said Leduc-Beaumont MLA Shaye Anderson. If the project is successful, it can help oil and gas companies, as well as farmers, turn non-producing wells into assets such as greenhouses. Much of the infrastructure costs needed to set up geothermal energy is already made by the previous well. Anderson said the cost of cleaning up a well site, including tearing down the roads to the site can cost a company up to $300,000 – a figure many of the smaller companies can’t always afford. “Some of these companies that aren’t producing anymore, if they could look at this and take some of that money that they had to spend anyway to abandon it and convert it to a geothermal well, and use it for example, a greenhouse, that would be fantastic. Then you’re seeing something out of it, you’re producing vegetables and fruits 365 days a year,” Anderson said. Geothermal projects like this also have the benefit of creating more jobs in the energy sector, setting up and maintaining the geothermal wells. The project started with Devon resident Dan Claypool, and Edmonton-based energy journalist Nick Wilson. Wilson approached Anderson during the election about the project, which grew bigger and bigger as more people came on board to try it out, the MLA said. It wasn’t long until Mitch Pomphrey of Pomphrey Industries came in to take the lead on the project, donating their time, energy, and expertise in the industry to show that geothermal projects like this can work. The project is part of the Alberta government’s Living Energy Project – a part of the Climate Leadership Plan – and the government has been working to create legislation around this kind of project. Before it was brought up, there was no legislation that would have allowed an oil and gas well infrastructure to be turned into a geothermal project. “There’s a vacuum there, there’s really no regulations to go on because it’s never been done before,” Anderson said. But it’s important for Alberta to take the lead on projects like this, which could spur similar developments across North America. “We talk about ourselves as an energy province, but this project might be able to show that we’re not just oil and gas, we’re an all-encompassing energy province. We can do solar, wind, geothermal, all of this stuff, co-generation, combined heat and power. It’s pretty developing project that can open a lot of minds I think,” Anderson said. Anderson sees major potential in geothermal to increase the quality of life of Albertans, as well as people living in Northern Canada, where communities are often powered by diesel generators.